Reading about the upcoming 2014 content marketing trends from Crazy Egg’s blog, I was reminded how SlideShare is still underused by most social media marketers. It still surprising how often this fantastic tool gets overlooked. Last year I spoke with PR Week’s Tanya Lewis about the use of SlideShare and PR. 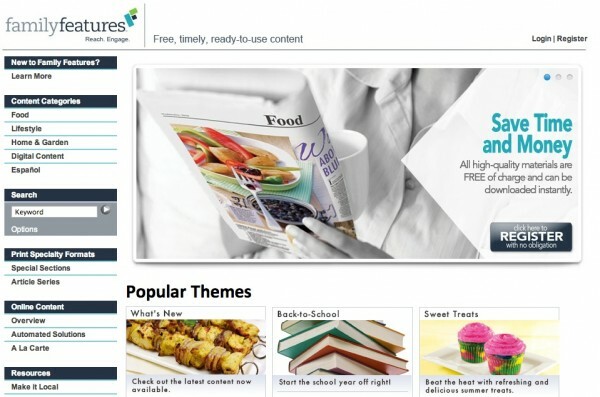 If you don’t know what Slideshare is, it is the world’s largest community for sharing presentations. With 60 million monthly visitors and and 120 million page views it is one of the top 150 sites on the Internet. Who doesn’t need more views to their website or content? 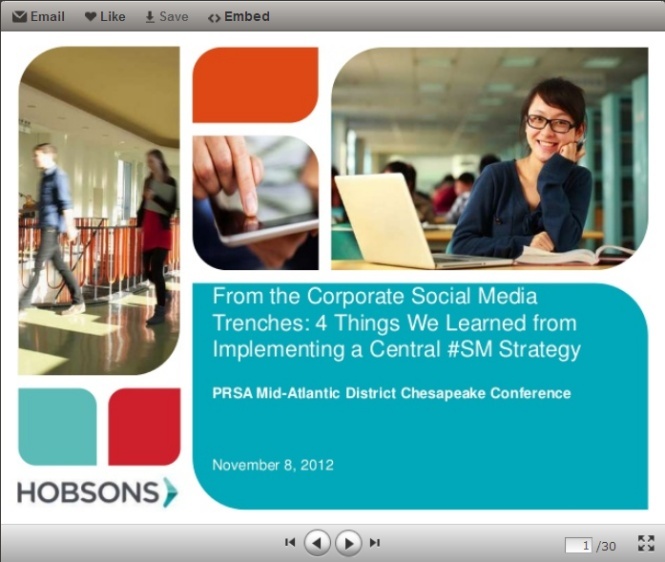 My presentation from PRSA event in November. Since presenting, it has been viewed more than 450 times. That is beyond the 50 plus folks in the audience who say it. Boom. Now that’s what I call increasing awareness. I am a huge proponent of SlideShare. For any marketer or public relations professional looking for ways to build their client expertise you shouldn’t look any further. Seriously. Who doesn’t have a Powerpoint to share? How many of you have client looking to you to create content? Here is a chance to repurpose and reuse good content. Here is my personal example using SlideShare, back in November, I had the opportunity to present to a regional PRSA conference. 1) More exposure. 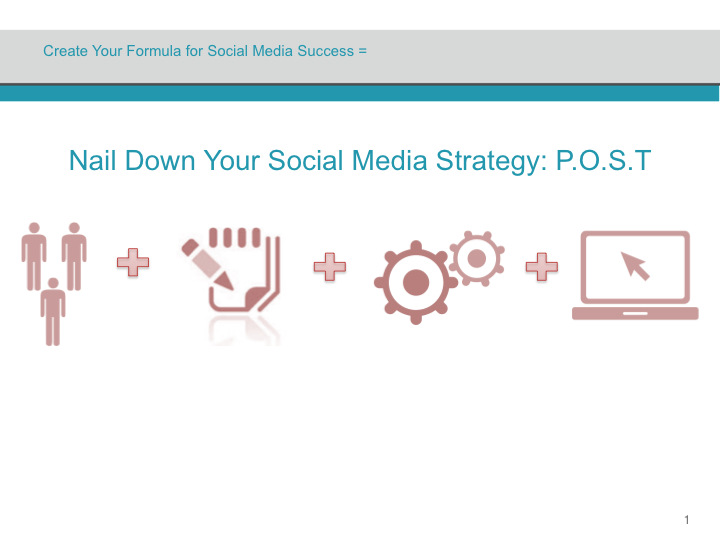 Since posting to SlideShare, the presentation has been viewed more than 600 times. Not trending on SlideShare, but definitely worth the investment of increasing my reach by 9X. 2) Someone from the presentation also blogged about it. Bonus! He blogged on Vocus corporate blog and linked to the SlideShare posting. This was a key driver of viewers to my SlideShare presentation. Bonus: a reporter from my local market also covered the story too. Love it. 3) Increased credibility. Amazing when you can share your ideas and thoughts, folks seek you out for advice and expertise. Building expertise through showing your work. Huzzah, what every PR person wants for their client: ability to leverage their expertise and get noticed. Final thought: You or your client already have some pretty decent presentation that are probably worth sharing. Why not give it a shot? So, you want to start a blog. Who doesn’t? There are almost 71 million WordPress sites. 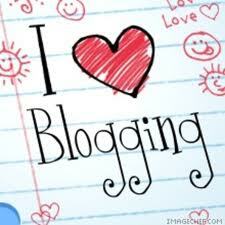 Why the blog craze? There are many benefits to writing a blog: brand awareness, build authority, content creation, and search engine optimization. One more to consider is a blog is the perfect platform to share you own thoughts and ideas. With so many benefits to blogging, what are some of the common mistakes to avoid when dipping your toe into the blogosphere? Thanks to my good friend, Veronica Steele who also co-wrote this post. You know what is sadder than dove’s crying? People who post infrequent on their blog. Generally speaking frequency of how often you post, depends on your goals. Hubspot surveyed more than 7000 businesses and corporations to benchmark blogging performance in 2013 (so what?). One of the biggest takeaways was that blogs producing more than 15 articles a month began to see substantial growth in site traffic. In fact, according to the charts, companies that blog 15 or more times per month get 5X more traffic than companies that don’t blog at all. 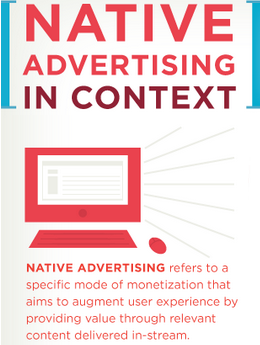 You heard content is king, but what does that mean? Anna Famery’s summary shared “If there is no content worth reading or seeing on the site, then people won’t go.” How do you fuel the content machine? Every blog should have a purpose. Without a purpose it has no direction and therefore no end point or target audience. At Concordia University Irvine there are several blogs with different purposes. Departmental blogs showcasing activities, student blogs giving a glimpse of student life on campus and travel blogs following study abroad journeys. Ready, set, write. Most people can’t begin writing with that mentality so don’t expect to be any different. As Rachel says, “Plan for success.” Create a content calendar to gives you structure such as deadlines on when posts need to be edited and posted but flexibility on the content of the posts. Life happens and you want to allow yourself the freedom to write on something meaningful so flexibility is really important. Also prepare for reader responses. Some readers may agree with your thoughts while others get offended. Either way, have a plan of action in your back pocket. How will you respond? Will you have comment guidelines in place that foster healthy, constructive and encouraging engagement? Preparing for after the post is live can sometimes be more important than before writing the post. You meant well. You thought your humor would come across in writing but it’s a flop. Don’t fret. The most important thing to keep in mind is this: noticing you are not engaging people is the first step to fixing the problem. Should the time come when your mom is your only follower (thanks, mom!) take a step back and assess your writing style, content and post timing. It may only be a minor adjustment that needs to take place not necessarily an entire blog overhaul (you thought you set the queued posts for 1PM but it’s set for 1AM! Whoops). Blog analytics can be your best friend or your worst enemy. Either way though, you should keep track of the results. Sure, the results could show that no one is clicking on your business’ website but that YouTube video was a huge hit! That’s important information. Blogging can be relationship builder. Honest, transparent and insightful content gains trust from audiences. Once trust is built the buying will soon follow. Bonus: Don’t forget to optimize your blog for key words. If folks can’t find your blog, all your interesting and important nuggets go to waste. Veronica Steele is the social media manager for Concordia University Irvine (CUI). She is responsible for CUI’s social media activities, which include engagement, strategy, branding, public relations, best practices and training. You can check out what Veronica is working on through her site, Digital Socialite.